You have decided to plant roots elsewhere and listed your home for sale. Now you need to stage the house to market and appeal to buyers. The key is to have potential buyers visualize this property as their own home. To see the memories they could make there and not just see it as a stranger’s home they’re walking through and analyzing. 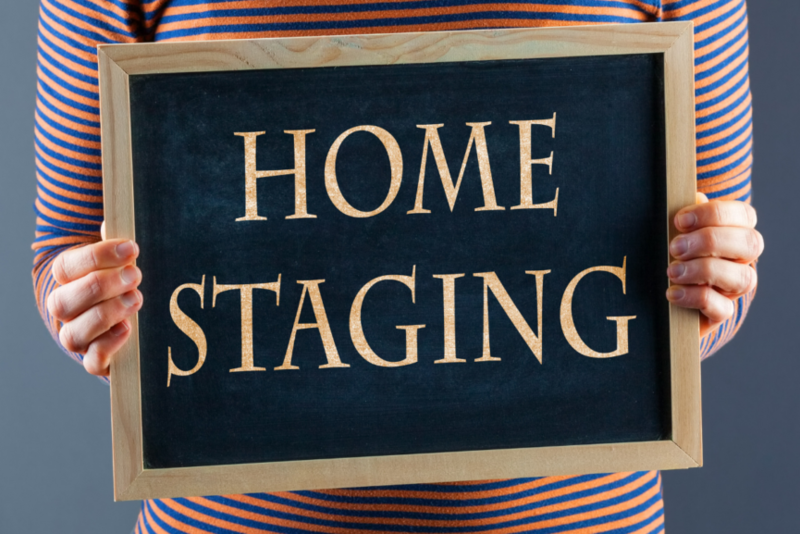 By storing, prepping and staging your home to be sold, you will increase the likelihood of a swift, smooth transition leading to an offer and closing deal. With a handful of prep techniques and go-to real estate tips, you can have your home show ready. Before you begin adding elegant and inviting touches to your house, there are some steps you should take to create a more accessible and stageable space. Although it may seem as though the best way to show your house as a livable space is to have your stuff displayed and set-up, it’s not the most effective approach. Start packing and storing as much as you can before you begin showing your house to buyers or promote to listing sites. Find a storage unit to rent for your excess belongings and big items such as living room furniture and bedroom pieces that way you will create an open canvas to work with. Open up space within your home to adhere to the idea of a big, spacious living space that many buyers are searching for. Other items that should be packed and stored before showing your home are personal pictures, knick-knacks, and collectibles. Remove any packed boxes you may have and store those in the unit or out-of-sight for walkthroughs. This will all help you declutter and maximize your home’s buyer appeal. The cleaner your home the better. Now that you’ve stored away furniture and personal items you can scrub every nook and cranny in your living space. If you’re strapped on time or just want a professional, thorough scrub, a cleaning service is always a great resource. Either way, you decide, in the end, your home needs to be sparkling. Put some extra elbow grease into cleaning the rooms that are your biggest selling points. This includes the kitchen, bathroom and living room. These three living spaces can make or break a sale, so it’s important to clean counters or vanities, dust shelves, clear any clutter or appliances off of counter space, and sweep wash and vacuum floors or carpet. If you are a pet-friendly home, you are going to want to make sure all the odor is out of furniture, carpets, etc. Open your windows and air out your home so it will have a fresh, spotless, ready-to-move-in feel when you’re ready to show. Are you packing up your house and getting ready to move? We can help with the storage and moving! Now that the backend work of packing, cleaning and improving your house is complete, you can focus on the attractive details and welcoming nuances of staging your home. The trick is to switch your perspective to the mind of the buyer, not just the seller. Understand what you would like to see when searching for a home to buy. Who is your market? Are you selling to an active family with kids ranging in age, an older couple who are finally empty-nesters, or young newlyweds searching for their first home? Whomever the market you may be selling to, it’s important to stage your home based off of how you’d think your potential buyer will connect to it. When arranging your home to show aim for bright rooms and living spaces Open up all blinds and adapt light fixtures when necessary. Dark rooms can turn a buyer away because when rooms don’t have a lot of light, they can appear smaller, even dirty. Make sure your house is well-lit throughout its entirety. Check your lampshades and exposed bulbs to make sure they are dust-free and illuminating at its highest potential. In softer spaces like bedrooms and bathrooms lighting is still vital but play around with different fixtures and mixtures of brighter and dimmer lights to add to a more intimate feel. Since most of your furniture and belongings are packed away in your self-storage unit, arranging the furniture left is crucial. There are different techniques realtors, and other staging management will use to visually appeal to the buyers and create optical illusions to make the most out of any space. By utilizing the interior-design technique, “floating,” you can optimize on space and aesthetic appeal. Simply pull your furniture away from walls, and thus natural isles will form allowing guests to walk through with ease and allow the room to appear larger. The heavy lifting and deep cleaning are complete, now the fun begins. This is the point in preparing your house for a sales showing that is creatively induced and has endless possibilities. Add details to your home such as a fresh vase of flowers, folded and fluffed towels in the bathroom, attractive kitchen towels visibly hanging and soft throw blankets draped over the ends your beds. Paying attention to personable, meticulous details like these will put your house on a different level than others on the market. You are showing a transparent look into the potential this house has as being a home for someone new. Moving is never easy, and the to-do list may seem endless. By giving yourself space and dedicating some time you can stage your home for optimum appeal and (hopefully) close in on a sale quickly. If you’re looking to store some belongings, big or small, give us a call, and we can get you set-up with a self-storage unit!